Turn left at AOR Go Past the Prog section and Keep On Walking. Anton Fig? Who he, you ask? He’s the cat in the hat that orchestrated the House Band on the Letterman Show for years. Yes; that him, but what kind of music would you expect him to produce left all alone in a studio? Probably not this, that’s for sure. 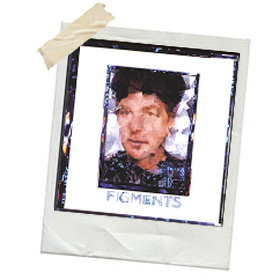 First released in 2002 and left gathering dust ever since, FIGMENTS opens with a late night experimental Soft-Jazz-Rock arrangement called home; featuring Beach Boys singer, ‘Blondie’ Chaplin on vocals. The first time I played the CD I had to play this three times before I dared go to track #2. Somewhere between latter day Santana and Journey would be the best way to describe it. Not unpleasant at all; but it took me by surprise. Chaplin takes the vocals again on the next track Hand On My Shoulder; but the band move slightly into a very pleasant Soulful Jazz groove; which is more to my tastes. It was a week later when I read the Press Release and CD cover that I discovered that Beach Boys Mastermind Brian Wilson arranged the lusciously layered track and provided background vocals. A few tracks in and my head was still spinning; when the feedback drenched Know Where You Go makes an appearance. There’s no other way to describe it than Adult Orientated Rock; and that’s what you get in all it’s restrained glory, with the added bonus of Ace Frehley on geetar. Do you see a pattern emerging here? What it must be like to have mates like these to call on? Just as I was acclimatising to being transported back to the 80’s a massive curve ball is thrown halfway through with the African rhythms of 3:4 Folk. In it’s own way it is one of the highlights of the record; (Fig is South African by birth) but sticks out like a sore thumb when you play the CD from start to finish. As you sit back to draw breath the next track Jan/Feb/March is an African/New Orleans hybrid with everything from whistles through saxes, an accordion, a banjo and assorted guitars are thrown in the mixer and a glorious World Music party-party sound comes out the other end. Yet another left-handed curve ball gets thrown towards the end when legendary singer-songwriter Chip Taylor does a passable Harry Nilsson impersonation when he is joined by a children’s choir and a string arrangement Phil Spector would have been proud of on When The Good Die Young. The first time I heard this song I sat open mouthed in awe; and subsequently have listened several times on headphones as it is an amazing track on every level. I’ve now got to take you back to track #4; which had me puzzled when it first drifted out of my car speakers, then the penny dropped and tears came to my eyes. More Than Friends is a wonderful song; quite laid back with glorious female backing vocals but the singer is……Richie P Havens! Dear God he has never sounded finer. What a glorious epitaph for one of Rock Music’s greatest voices. Listening to FIGMENTS in one sitting isn’t easy. Every track certainly has something ‘special’ about it; but there are too many different musical styles for my tiny brain to comprehend; making the end result (sadly) not as good as the individual constituent parts; but definitely worth seeking out.